Hermann Andreas Reimer (1825-1906), a doctor born in Berlin, opened the first "Heilanstalt für Epileptische" ('Nursing Home for Epileptics') on August 1st 1855. The building was in a lonely country area at the foot of the Obermühlberg near Görlitz, 30 km east of Dresden. The house was built around the middle of the 19th century in the Italian Villa style typical of this period. At first, the home was intended to tend to the needs of twelve patients with epilepsy from affluent families. A place in the home cost 30 Friedrichsd'or per year and had to be paid six months in advance. Each patient had two rooms. The common rooms were intended to have a positive effect on the patient's well-being. One orderly was responsible for looking after two patients day and night. His room was situated between the rooms of his two patients. There were special beds, no objects with sharp edges, and soft rugs to lessen the danger of the patients injuring themselves if they fell during a seizure. As there were, however, few people with epilepsy who also had money, Reimer's nursing home soon got into financial difficulties. As a result, mentally ill patients were also admitted, the most famous of whom was Christiane Friederike Wilhelmine (Minna) Walch née Herzlieb, who Goethe made immortal in the character of Ottilie in his novel "Die Wahlverwandtschaften" ("The Elective Affinities"). 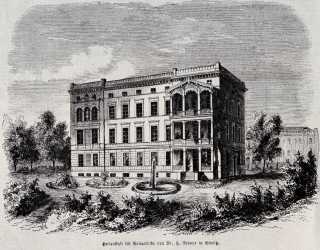 In 1867 Dr Reimer handed the institution over to the German psychiatrist Karl Ludwig Kahlbaum, who ran it until his death in 1899 and built its world-wide reputation. The building built by Reimer has survived the passage of time, if in a somewhat altered form. Today it houses the 2nd Medical Clinic of the Görlitz District Hospital.